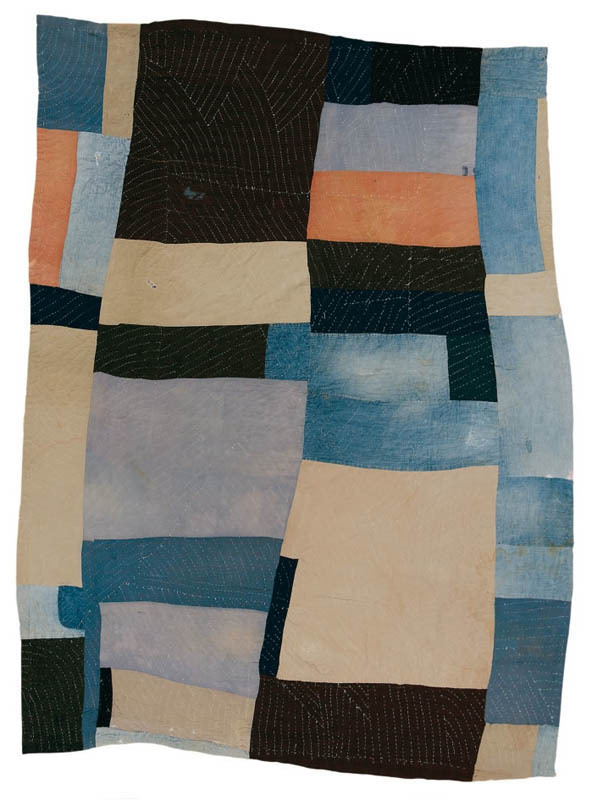 Lucy Mooney, Blocks and Strips work-clothes quilt, ca. 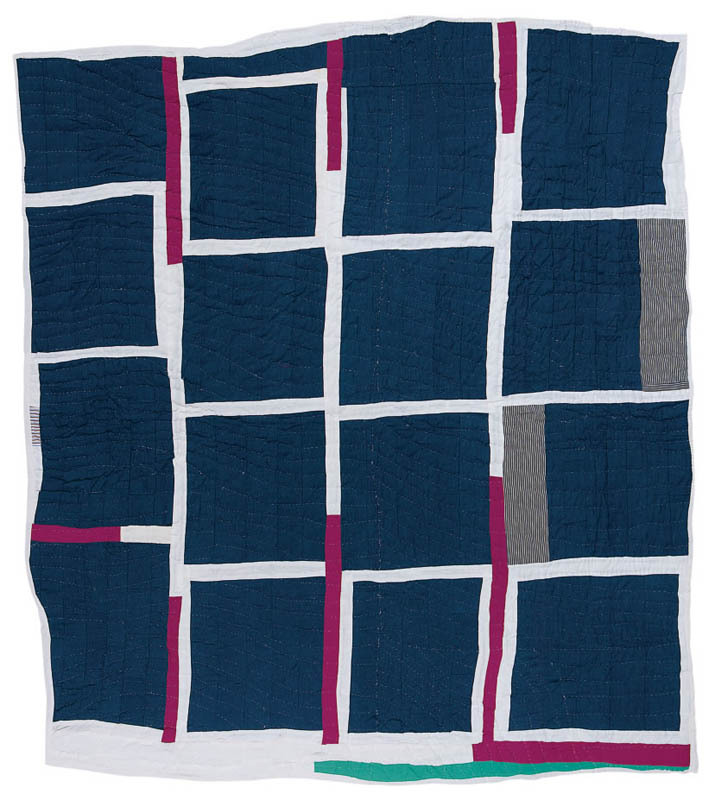 1935; cotton, denim, wool, 87 x 68 in. 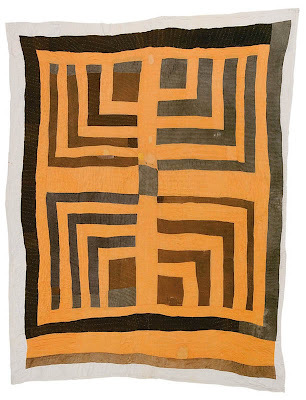 As I began to ponder my offering of art for my New Year's post––I love to present work each year that has something open hearted about it (last year Frans Masereel, the year before Sonia Delaunay)––I thought of the stunning quilts made by the women of the tiny hamlet of Gee's Bend, Alabama. 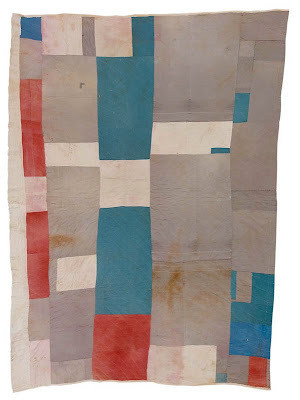 I still remember the thrill I felt seeing these works about 10 years ago in an exhibition at the Whitney; they seemed surprisingly modern, nothing like the traditional quilts I'd been used to seeing. It was when Daddy died. I was about seventeen, eighteen. He stayed sick about eight months and passed on. Mama say, "I going to take his work clothes, shape them into a quilt to remember him, and cover up under it for love." "For love". To me, all these quilts have a deep feeling of love––for color, for shape––and a sheer joy in creating. 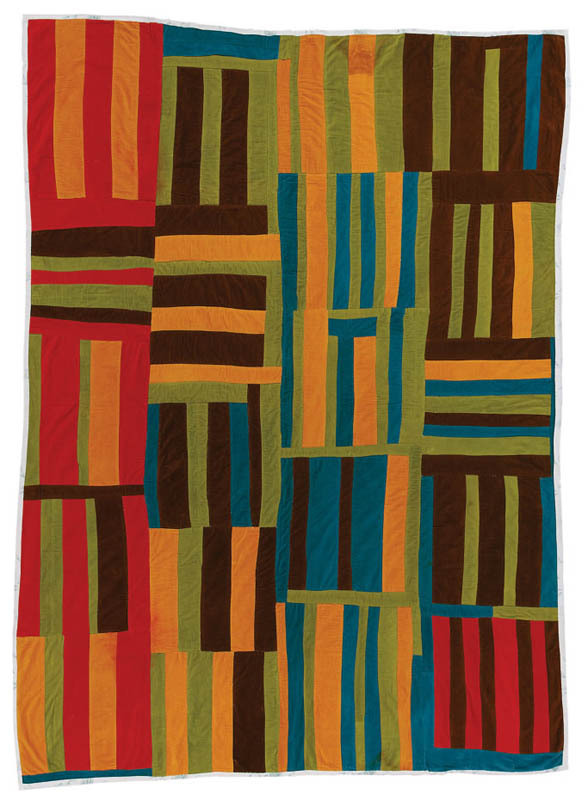 The two "Housetop" quilts above show how inventive the quilters were with color and pattern. 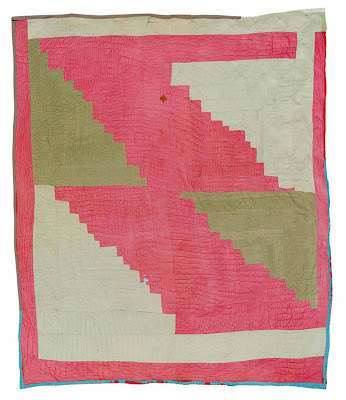 The Pettways must be an extraordinary family, since so many by that name have quilts in this collection. Lucy Pettways "snowballs" are energetic and full of bounce, so much more than seems possible in a simple repeat pattern. Annie Mae Young, Blocks and strips, ca. 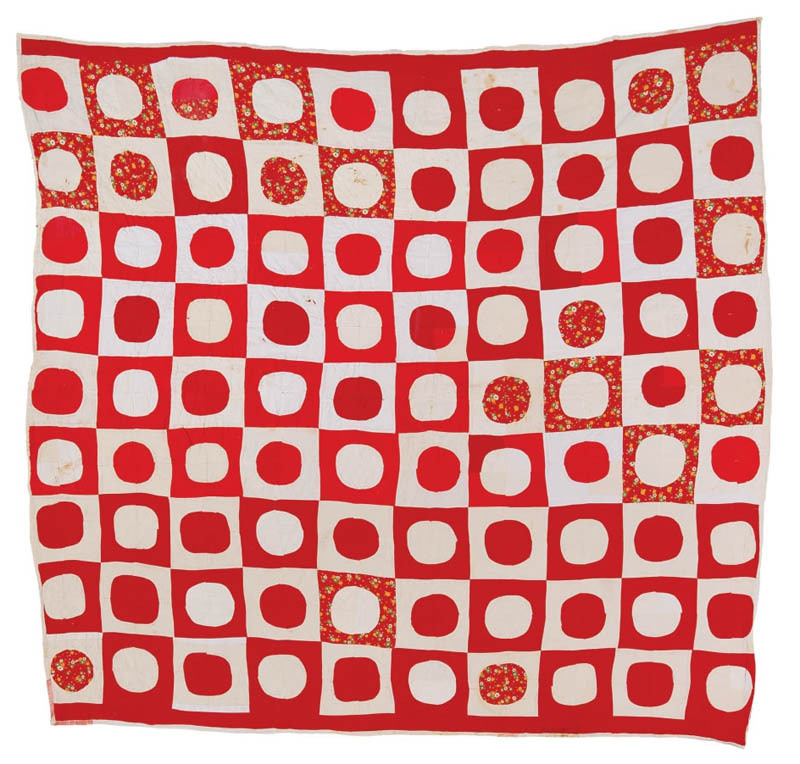 1970; cotton, polyester synthetic blends, 83 x 80 in. ....but often bold in contrast. I wonder what Mondrian would have thought of this quilt, a Southern boogie woogie. Florine Smith, Four block strips, ca. 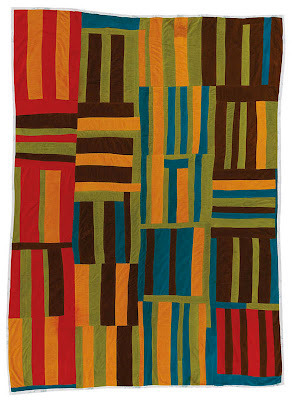 1975; corduroy, 68 x 81 in. This work is so simple yet so powerful, powerful in a joyous, heart-expanding way. 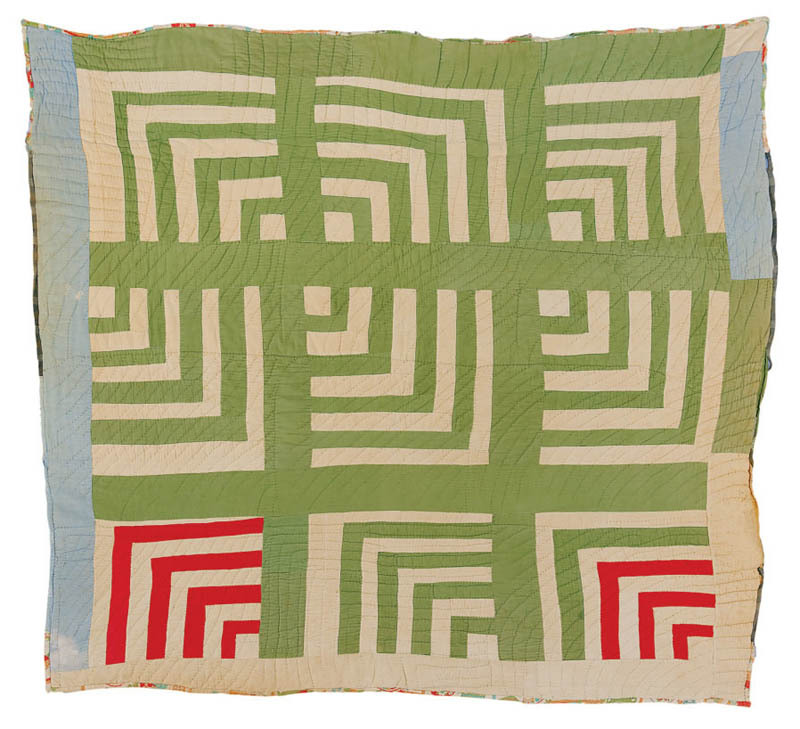 Louella Pettway, "Logcabin" four block variation, ca. 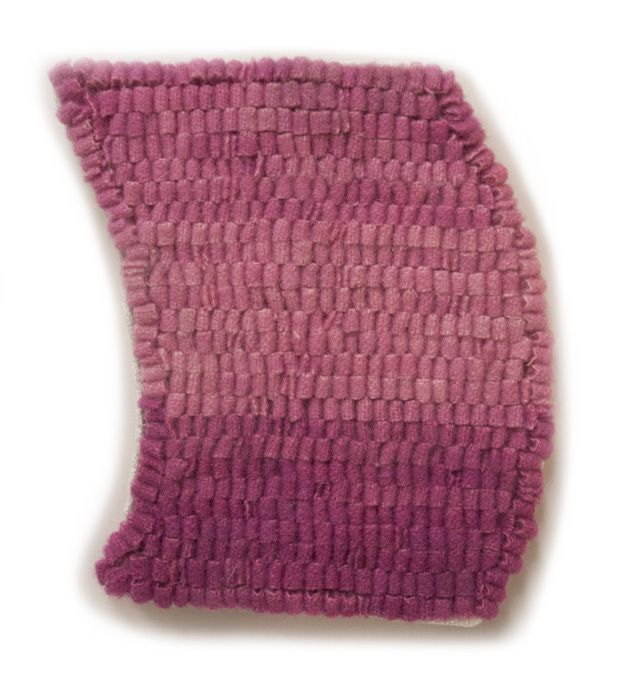 1975; corduroy, 79 x 71 in. And the color of this...that pink and gray green! 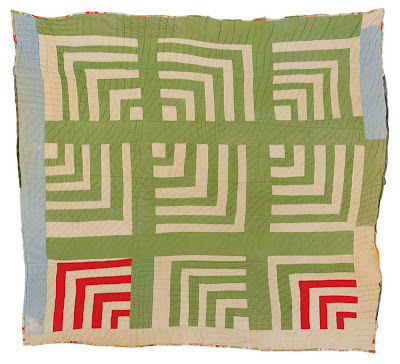 And such an marvelously idiosyncratic way of using the log cabin pattern. 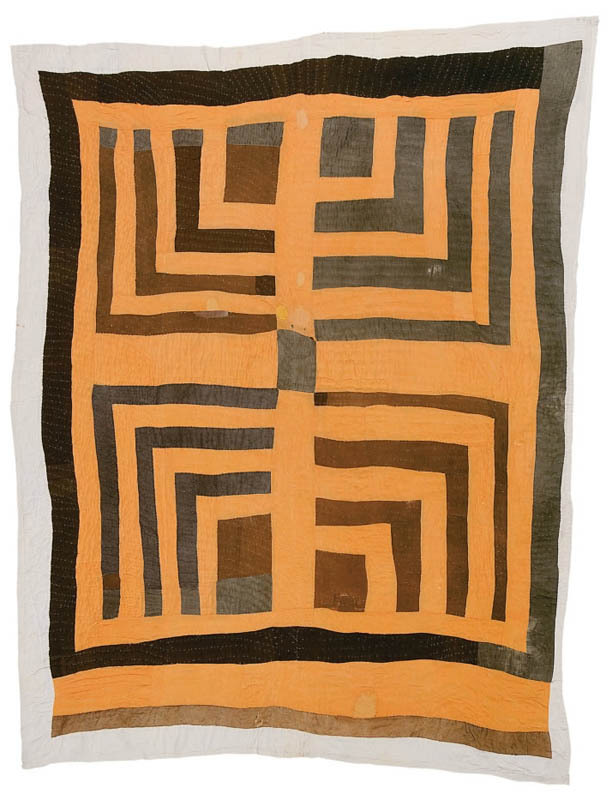 If you want to see the usual regularity of this quilt pattern, click this link and you'll see what an artist Louella Pettway is. Willie "Ma Willie" Abrams, "Roman Stripes" variation, ca. 1975; corduroy, 94 x 76 in. 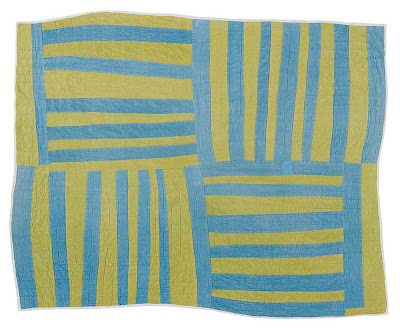 This quilt pulses with color, its bars setting up a syncopated rhythm. Looking at all these works makes me happy, which is a good way to begin a new year. I wish you all a year full of joy and love and happiness, and full of creativity, whether in making a piece of art or a meal, or in simply looking about with careful attention. A New Painting: "Blue Circles"
Blue Circles, egg tempera on calfskin parchment, 5 x 7 1/2 in. 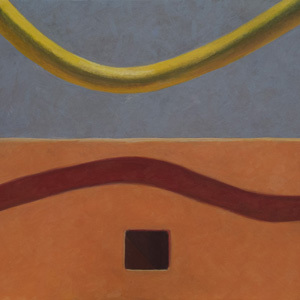 This painting is a bit different from my recent work; it has more elements in its composition. 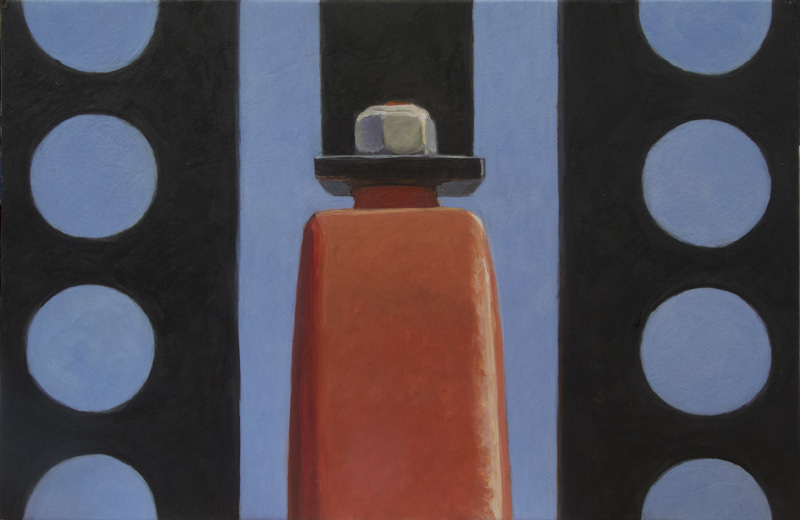 I have been moving towards simpler imagery over the past couple of years, but I couldn't resist those rows of circles and the red form topped by the bright nut, which itself is finished with a smidgen of red. 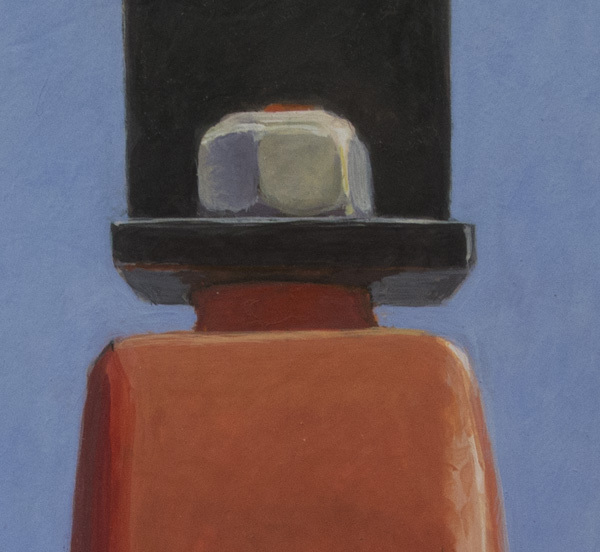 When I began working on the painting, I tried leaving out the nut, thinking it would make the image more abstract, but it didn't work; it needed that light spot as a focus and to balance the blue circles. Try covering it and see if you agree. For me, it adds zing to a sturdy lineup. 8 7/16 x 13 1/8 in. Even though we don't all live in a snowy climate, as a culture we long for a "White Christmas", whether because of Irving Berlin and Bing Crosby or for other sentimental reasons. Winter started off cold here in northern Vermont, with a lovely blanket of snow, but this past weekend I've been sad to see the snow diminish with warm temperatures and rain....so, I thought it would be fun to wish all of you, my dear readers, a happy holiday season with a grab bag of snow images from across years and around the world. 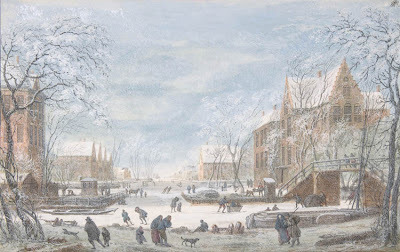 I went to the Metropolitan Museum of Art's website and typed in the search word "snow", which you can do here too, and up popped 317 works of art. I chose a variety to show and have posted them here in date order beginning with the earliest, mixing mediums and places of origin. 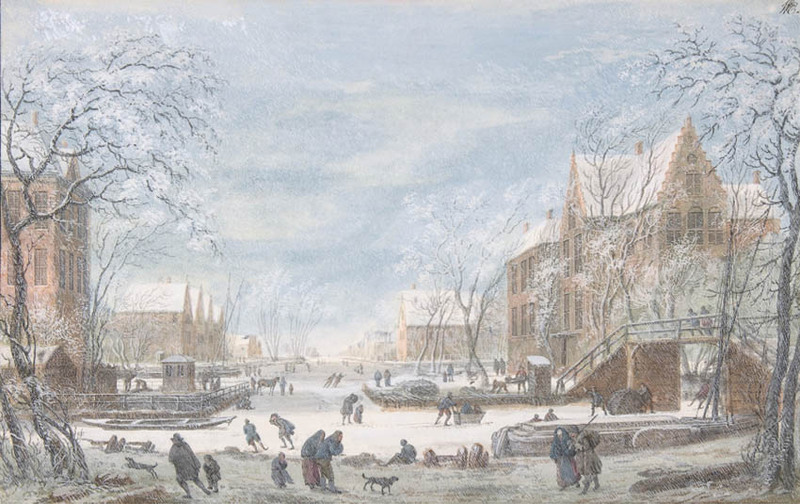 If you click to enlarge the townscape above, you'll see some figures huddled against the cold, and some enjoying a skate on the ice of the canal. 14 7/8 x 6 3/4 in. 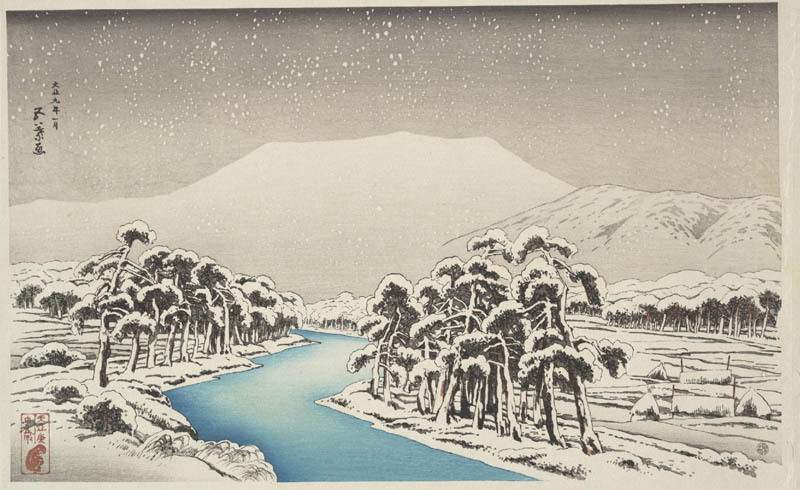 Japanese artists seem to particularly prize the subject of snow, since there were many prints in the Met's collection picturing it in various ways. 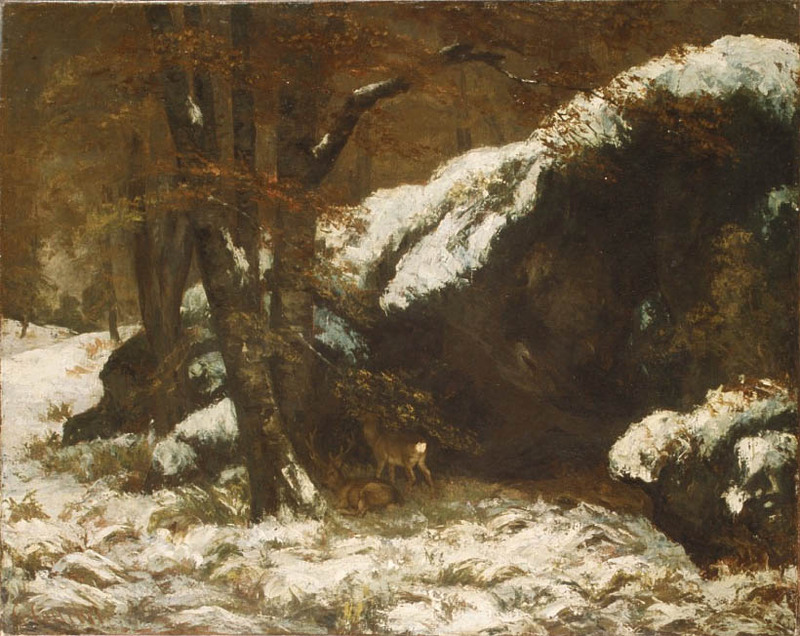 Gustave Courbet, The Deer, ca. 1865; oil on canvas, 29 3/8 x 36 3/8 in. There's always a raw, edgy beauty in Courbet's landscapes. Claude Monet, Haystacks (Effect of Snow and Sun), 1891; oil on canvas, 25 3/4 x 36 1/4 in. 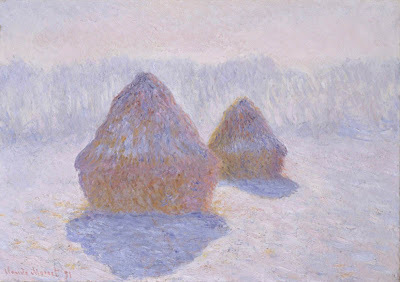 Monet, painting 25 years later, is entranced by light. 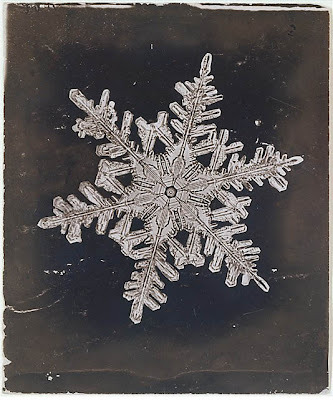 Wilson Alwyn Bentley, [Snow Crystal], ca. 1910; gelatin silver print, 2 5/16 x 3 9/16 in. 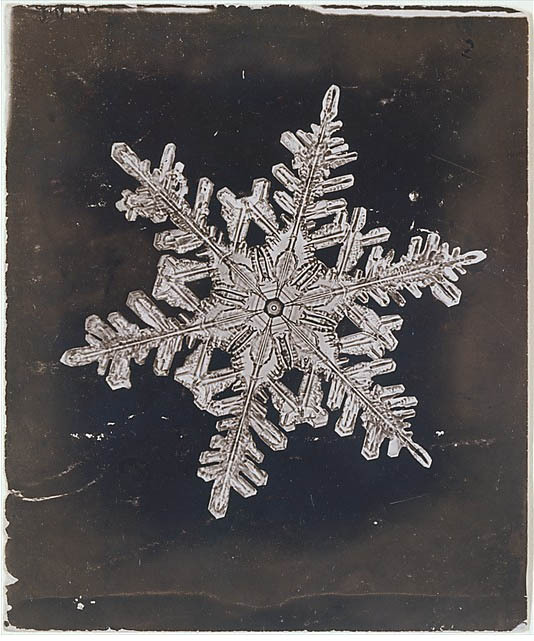 Bentley was a self-taught farmer from Vermont, who was the first to photograph single snowflakes, using a microscope attached to a bellows camera. Alfred Stieglitz, The Terminal, 1893 printed 1911; photogravure, 4 3/4 x 6 5/16 in. 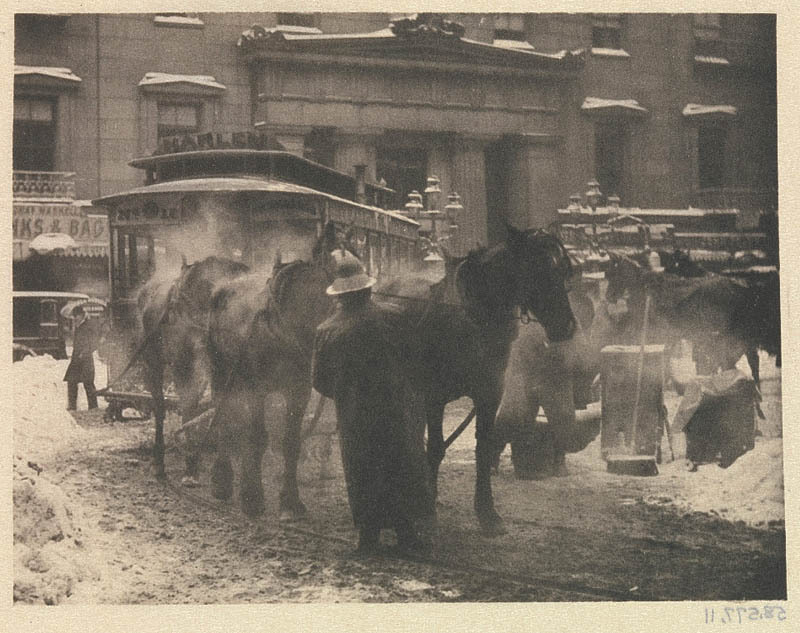 I love this early view of a city street, busy with steaming horses pulling vehicles, messy with slushy snow. 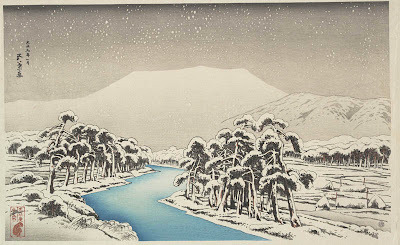 Hashiguchi Goyo, Ibuki Mountain in Snow, 1920; polychrome woodblock print, 9 x 15 in. 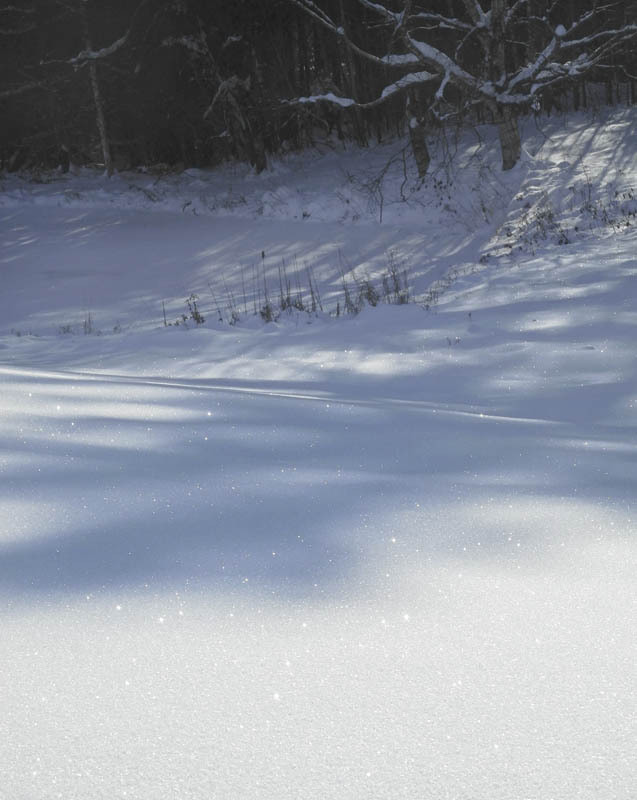 Goyo shows us a white countryside, bisected with a still-blue river. Josef Albers, Vor Meinem Fenster, 1931-32; gelatin silver print, 9 3/16 x 6 5/16 in. 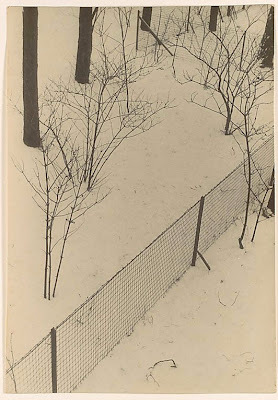 Albers finds order and clarity in a snowy view from his window, the bisection a fence. 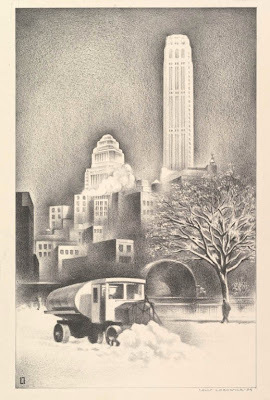 Louis Lozowick, Snow Scene, 1934; lithograph, image 13 3/4 x 8 3/4 in. It's fun to see an early snow plow, working the streets of New York City. Ski Ensemble by Shawmut, 1935-45, American; wool. Since for many, Christmas week means skiing, I couldn't resist including this ski outfit in the Met's collection. 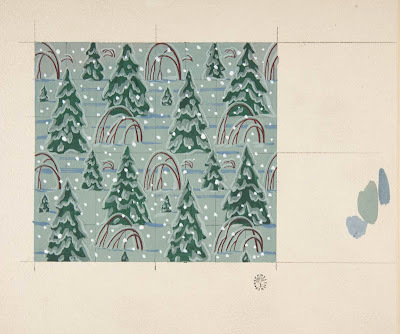 Rockwell Kent, Snow Laden Pines, ca. 1950; gouache on board, image 5 x 6 in. 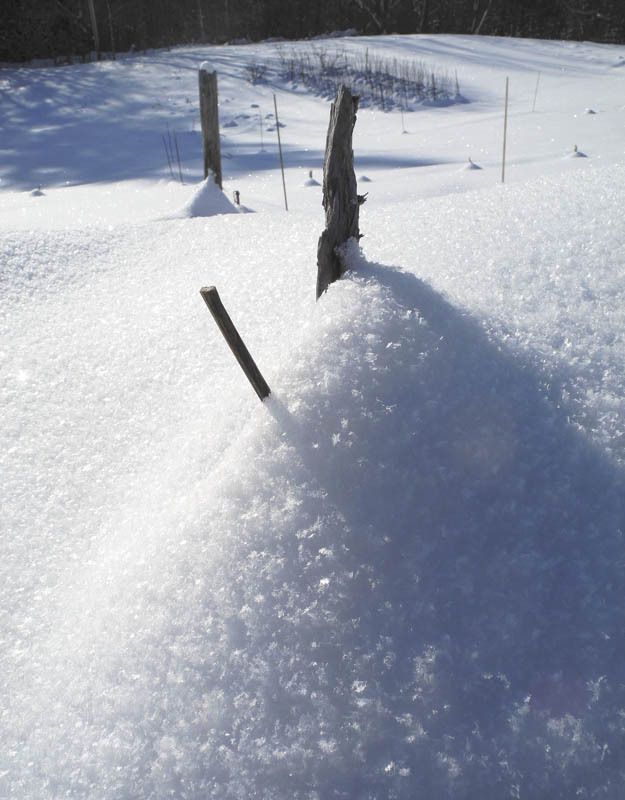 This is a charming textile design with saplings bent in snow and bright white snowflakes. 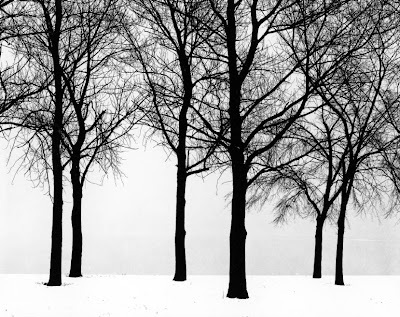 Harry Callahan, Chicago, ca. 1950; gelatin silver print, 7 5/8 x 9 5/8 in. 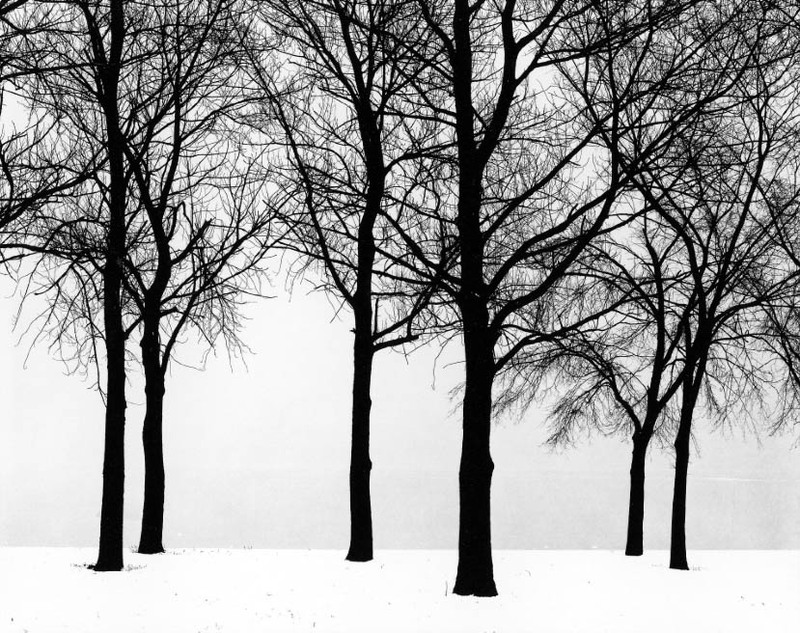 Like Albers, Callahan is inspired by the stark contrasts offered by trees and snow. 66 1/2 x 31 3/4 in. 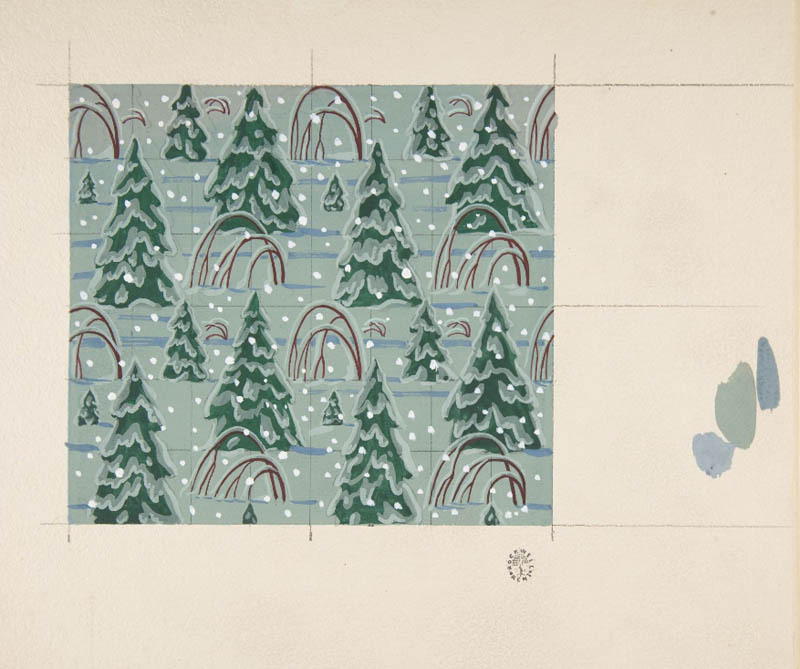 I doubt that Matisse saw much snow in the south of France, but the description of this work guesses that he might have been inspired by the early spring flower, the Snowdrop. Dennis Oppenheim, Annual Rings, 1968; mixed media, 40 x 30 in. 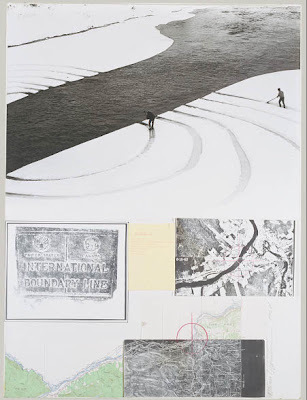 Finally, a piece documenting one of Oppenheim's earth works, Annual Rings. The shoveled lines represent the growth rings of a tree, and they continue across a waterway separating the US from Canada. Whether you are looking out your windows at snow or at palm trees, I hope you have a wonderful holiday week! 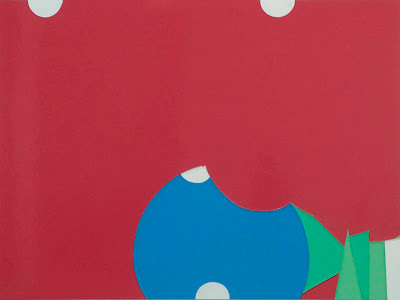 Blue Skies, 2013; enamel on aluminum, 44 7/8 x 60 in. I feel different kinds of pleasure seeing shows that I love; my feeling can be meditative, there can be an intellectual excitement, a joy in color and shape or in carefully attentive work; the work's presence can be big and bold or small and modest; there are so many things to love. 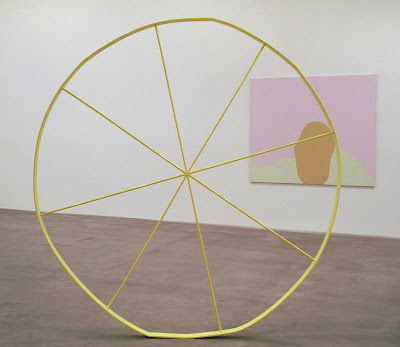 When I walked into Gary Hume's show at Matthew Marks, "The Wonky Wheel", and was confronted by a huge, wackily painted door, I did not know what to expect as I'd never seen Hume's work before. Well, I loved the show; it made me feel light and happy. The bright colors, often in surprising juxtapositions, and the irregularly organic shapes seemed full of joy. 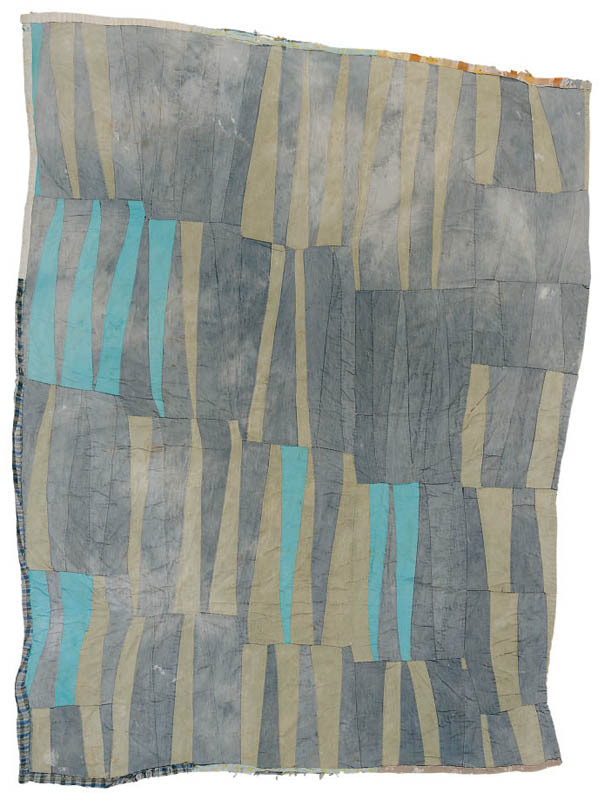 Stripes, 2013; enamel on aluminum, 45 1/8 x 60 in. 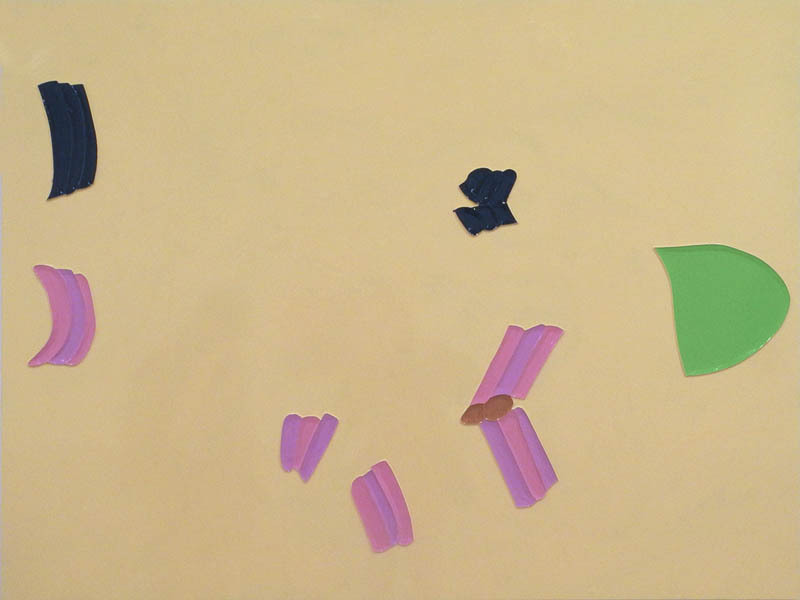 In this painting, odd shapes are wandering across the glossy surface, pinks and purples playing with green, bright and dark. The high gloss of enamel paint might be very off putting, but in this case it reads as warm and rich to me. The gallery assistant told me that Hume uses hardware store paint, making stencils that he fills with paint which leads to shapes with raised edges, each shape strongly delineated by its border and catching the light festively. The Wonky Wheel (Yellow), 2013; enamel on aluminum, diameter 83 7/8 x 2 3/8 in. motif is based on a Navy SEAL's telescopic gun sight, re-creating a sharpshooter's perspective from the artist's own point of view. Well, I am stumped; there's nothing in this piece that speaks of violence or war or tragedy, not to me. So what do I do about my responses? are they way off base, or is this an instance of the artist not knowing what he hath wrought? Is he trying to undermine the origin of the image by the jolly presence of the sculpture? Is this something like 1960s Flower Power, sticking colorful blooms in gun barrels? I realize that artists, including myself, cannot control how people see our work; galleries try to do so with press releases and artist's statements, but is this all in vain? I usually like when a viewer sees something in a work of mine that I had not at all intended. 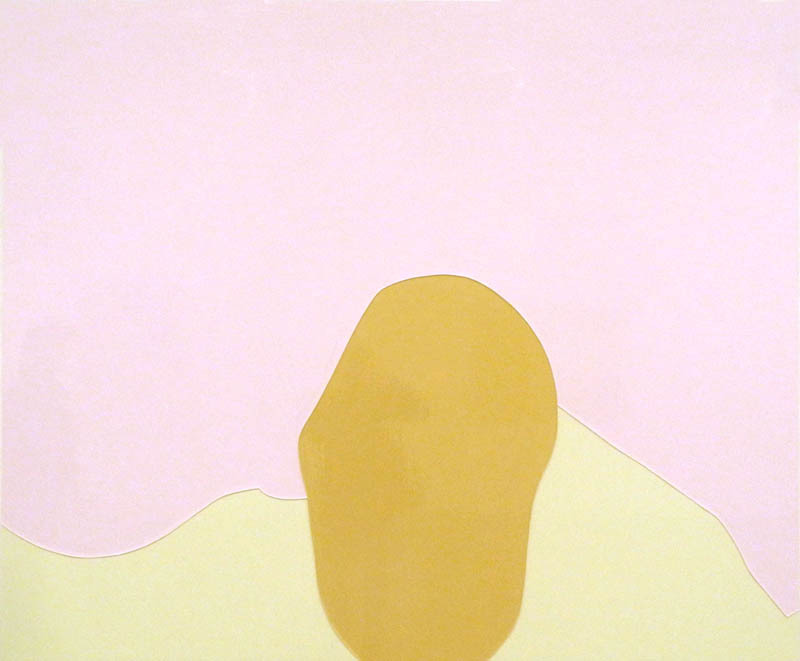 The Mound, 2013; enamel on aluminum, 60 x 72 in. Drawing inspiration from a commemorative publication celebrating the assassination of Osama bin Laden, Hume's new compositions isolate and fragment the photographic source imagery to near total abstraction. 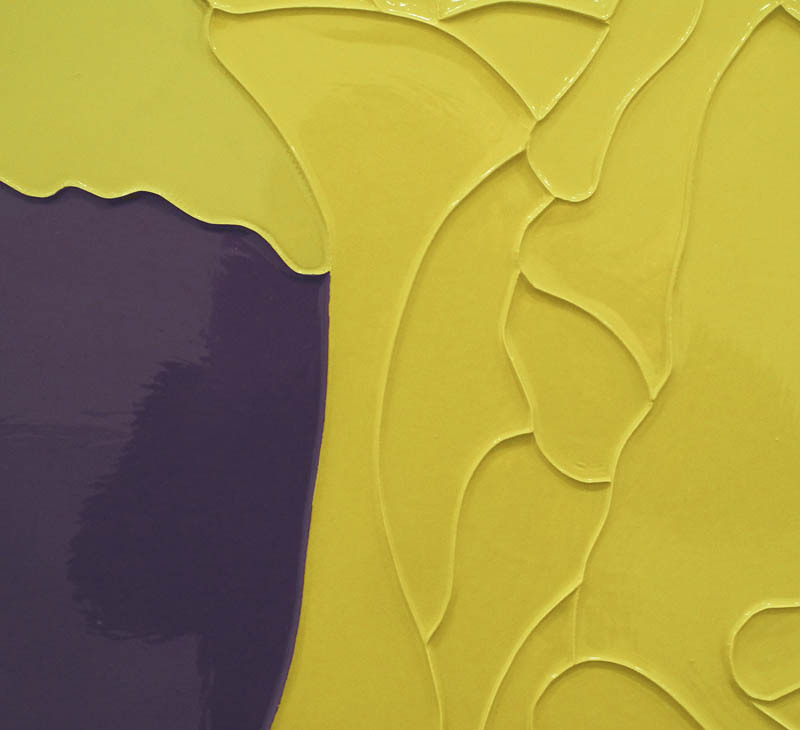 Fetish, 2013; enamel on aluminum, 78 3/8 x 55 7/8 in. This painting was one that I might imagine to be about night and stealth, but brightened by the bits of green and red at bottom. The shape floating at the left looks like a telephone, the only vaguely representation image in the show, except for another, Sniper Circus (which I didn't photograph), whose image source as a gun is more evident. 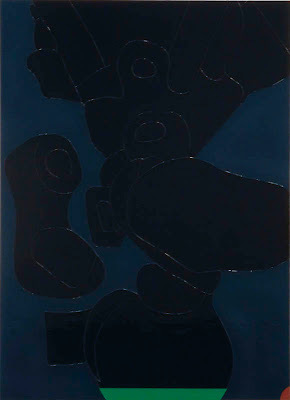 I like the moodiness of this work, but even with its dark palette, it is lush because of the shapes and glossy paint, a tropical night. 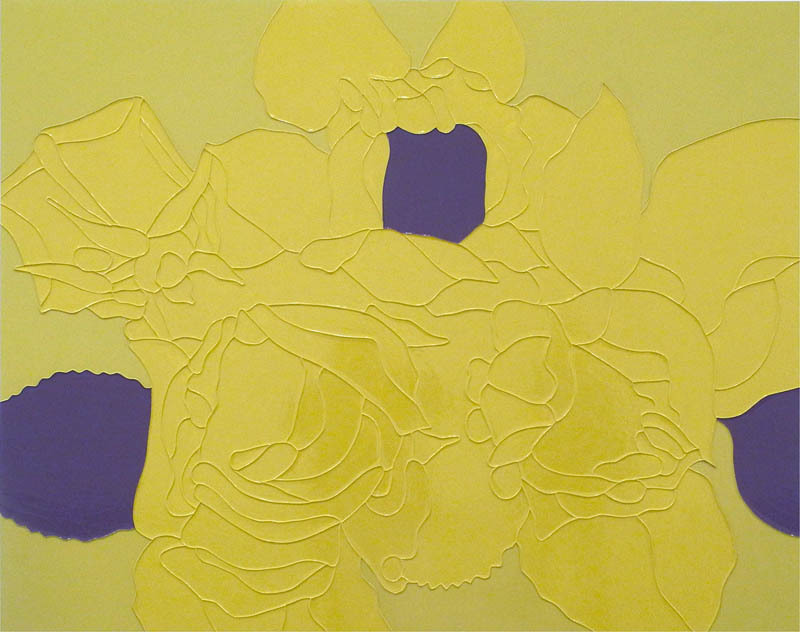 Tribute, 2013; enamel on aluminum, 44 1/8 x 56 1/4 in. 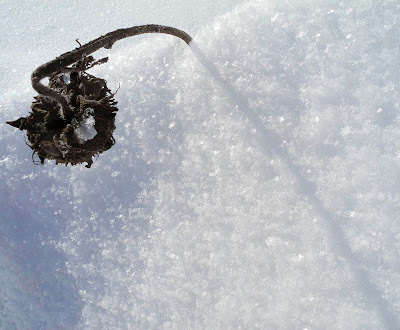 nature will always return after history's wonky wheel has trampled it. Hume's view is, to some, overly optimistic, which might be a key to his body of work. In this painting, I like the closely hued yellows, walloped with purple. The elegantly swirling lines are complex and fluid, like multi-petaled roses or peonies, yet frozen in shallow ridges. The changing light as you move in front of the piece gives it a life it would not have with a non-reflective surface. 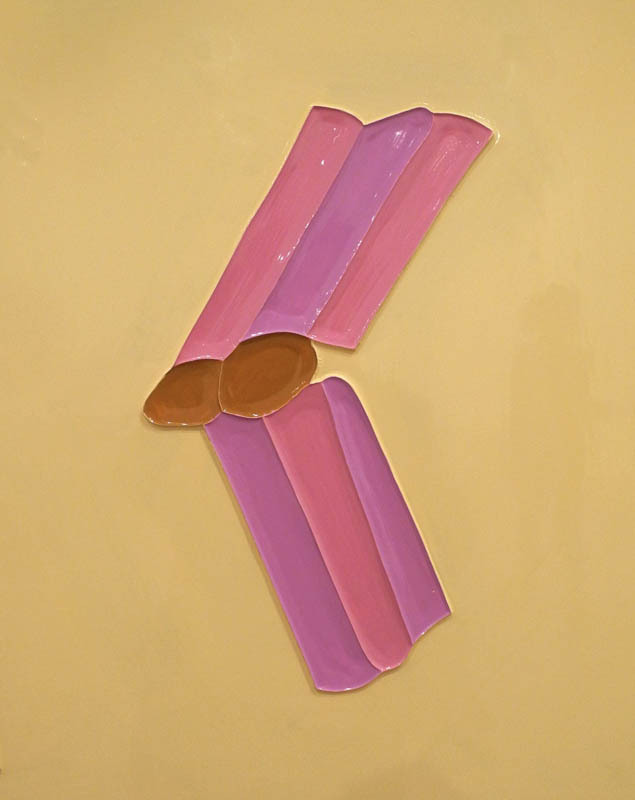 Bones, 2013; enamel on aluminum, 60 1/8 x 45 in. I find Hume's odd shapes quite marvelous, here with more simple shapes floating above the smaller, more angular ones. They all hover within a field of pink, a cushiony color, maybe flesh and bone? If the source image was dreadful, the artist has transformed it into something light and gay, at least to my eyes. The Red Meeting the Blue, 2013; enamel on aluminum, 54 x 71 5/8 in. 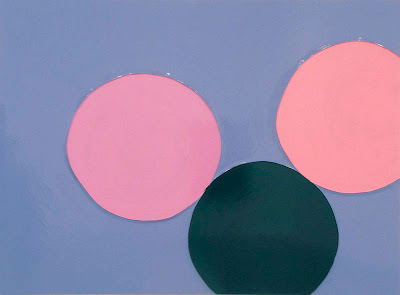 Red blue green are Ellsworth Kelly colors, but how differently Hume uses them. 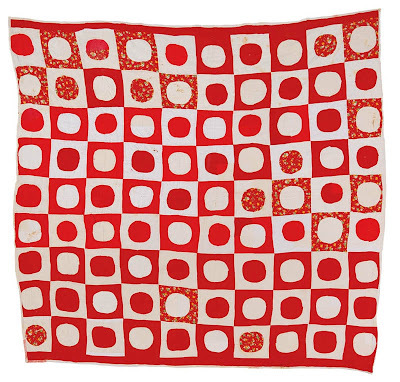 In a large field of red a shape rests at bottom, white partial circles adding a visual rhythm, repeating the bite taken out of the blue. 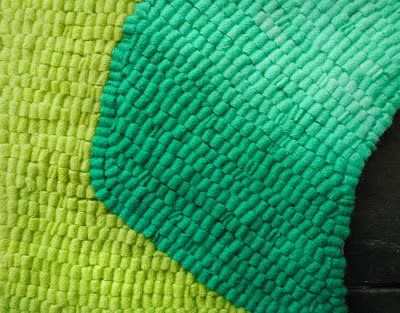 The green is angular, jagged, yet for me the whole image is jocular rather than tragic. In all his paintings the bright colors, the rounded forms, the reflective surfaces, fill me with an aesthetic happiness.....no matter the source of the images. 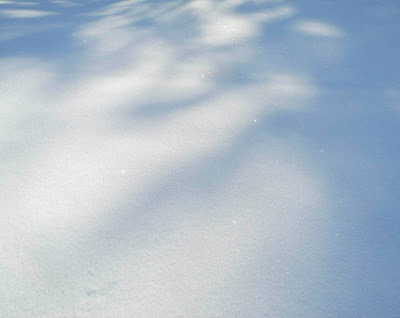 It has been said that Eskimos have many words for snow; if that were true, there would be a vivid word to describe the snow as it was here today: made up of tiny flakes that captured the sun and reflected it in tiny points of light, gleaming in light and in shadow. As I walked along, they sparkled and glowed as though I was wandering through a magical kingdom studded with diamonds. 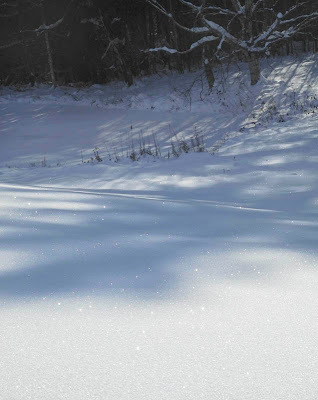 The flakes looked like bits of mica, glittering brightly. 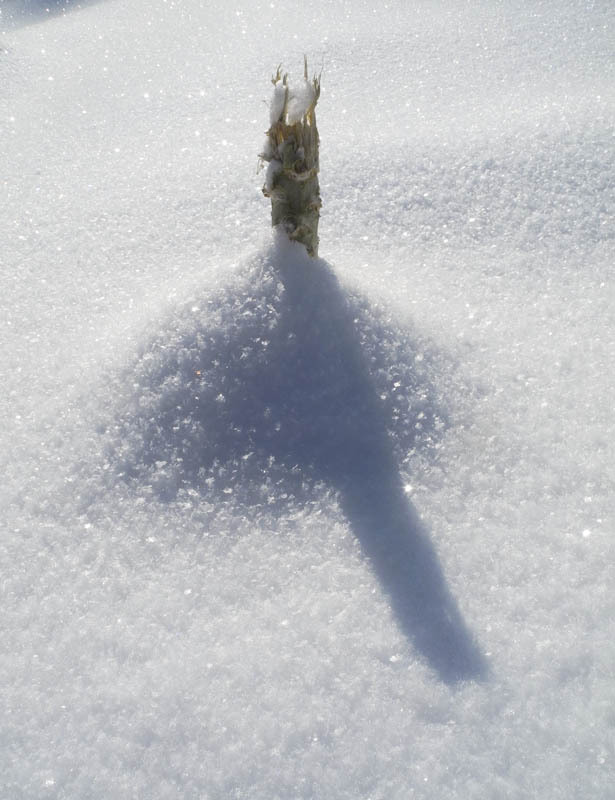 ....and the remnants of vegetables in the garden, creating cones of light and cool shadow, their pure geometry interrupted by shards of light. 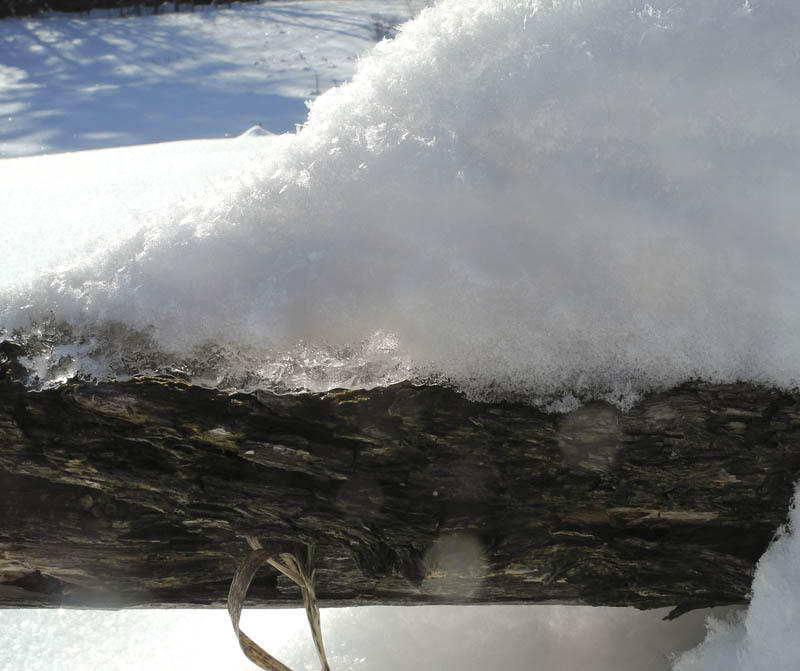 Beneath the snow, a clear layer of sun-shot ice contrasts with dark wood. Snow and soft, long shadows. Finally a mild day so I could be outdoors to enjoy the air and light, and the sparkle. I realize that these photographs do not do a very good job in depicting the particular light of this snow, but I couldn't resist giving it a try. Do click to enlarge them to see the details more clearly; it was a special snow that will lose its light in the gray of coming days. 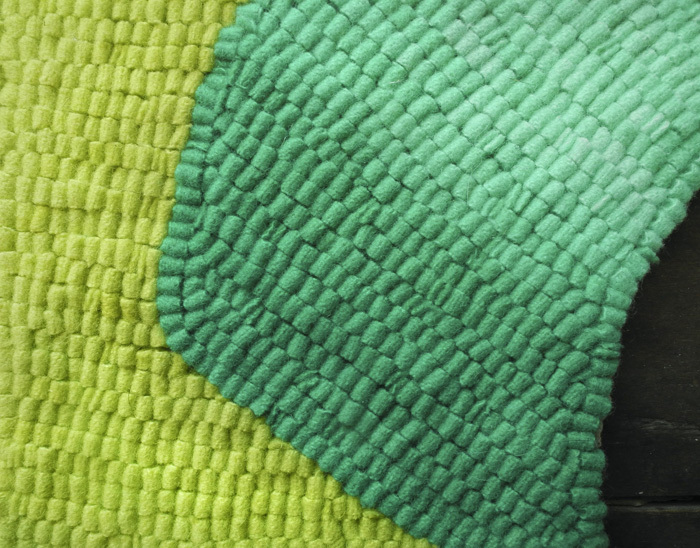 Swoops, hand dyed wool on linen; 2 pieces: 14 1/2 x 14, 5 x 4 1/2 in. ; 14 1/2 x 15 overall. 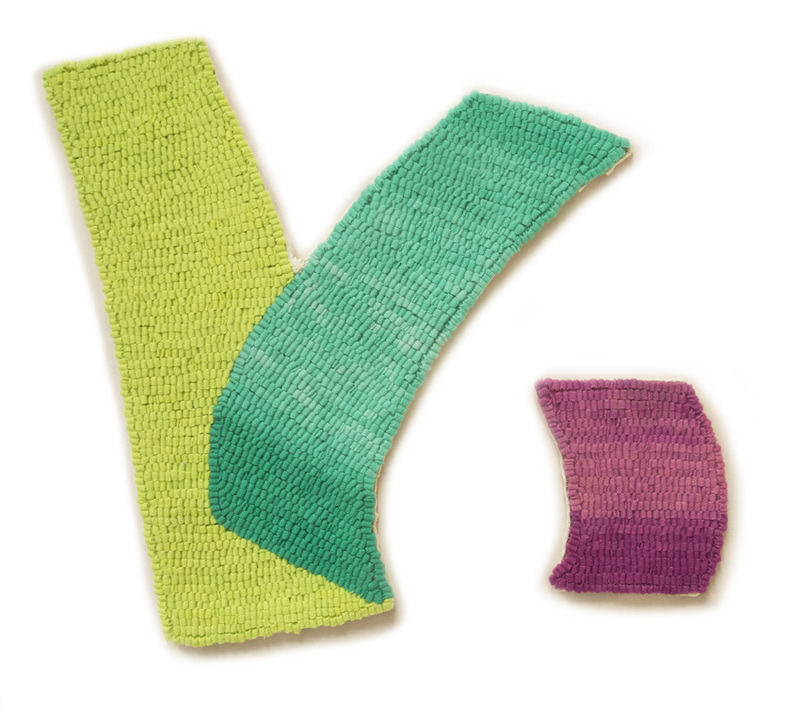 After making a couple of textiles with very simple designs, I had a yen to go for the complex. 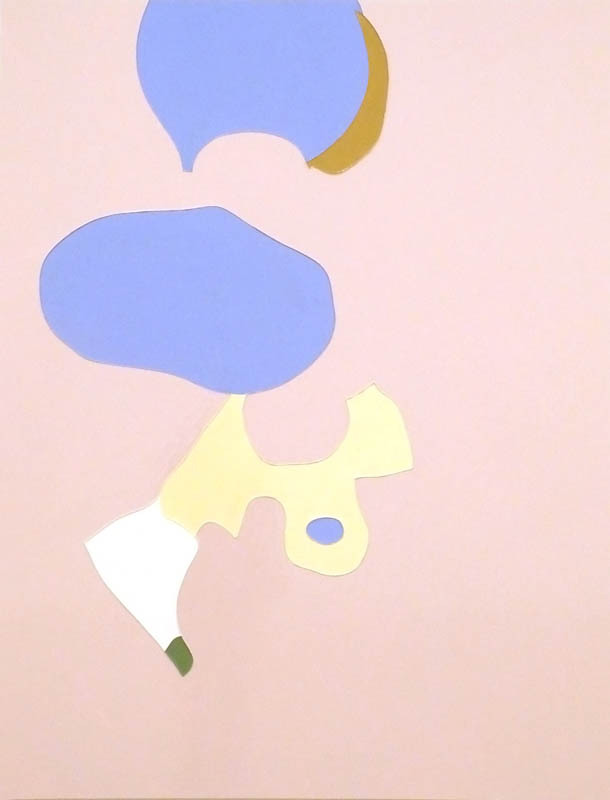 I had some sketches combining illusionistic parts with flat shapes and chose the one you see above on the left. As I looked at the sketch, I thought it'd be interesting to add another element, one that added an opposite movement to the curved green form, so I drew the small curve. I like the opposing energies. I should tell you that the yellow shape really should have been a straight line, but for some reason, after I'd hooked the wool, it had a curve. Luckily the curve was opposed to the curve of the green shape, so it works anyway (I think). 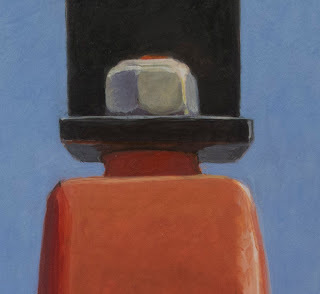 Here's a detail which makes the illusion of the piece clear: all is flat, with just hue/value and hooking direction, along with outline, to give a sense of form. And here's the separate reddish pink form, looking as though it is bulging outward. 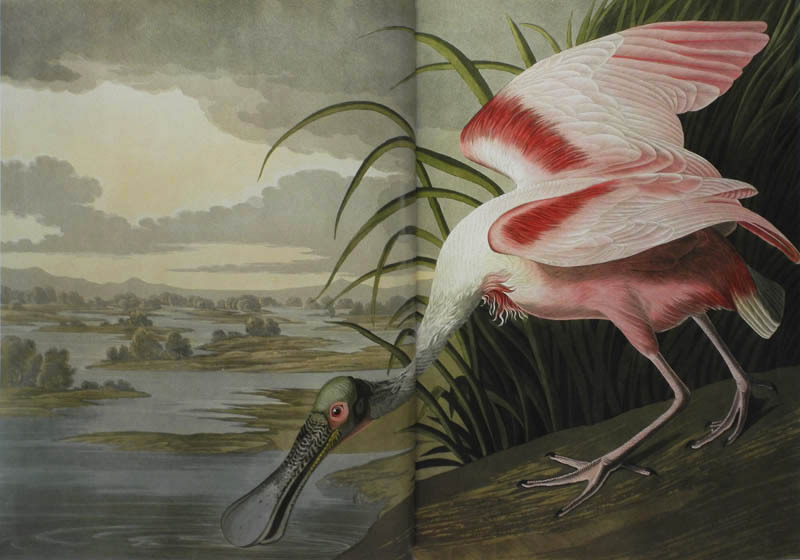 Being a great admirer of his work, for many years I had a yard sale print of John James Audubon's (1785 - 1851) Roseate Spoonbill hanging in my mudroom. What a wonderful color that bird is! and its wacky beak, green head and red-rimmed eye give it a lively quality. I am not a birder, so it is mainly the art of his prints that I love so much: the powerful compositions and the clarity of form. So I was very happy to receive as a gift* (see note below) Audubon's Birds of America: The Audubon Society Baby Elephant Folio, with an introduction and notes by Roger Tory and Virginia Marie Peterson. Roger Tory Peterson is the author of essential bird guides; I refer to his Eastern Birds often. 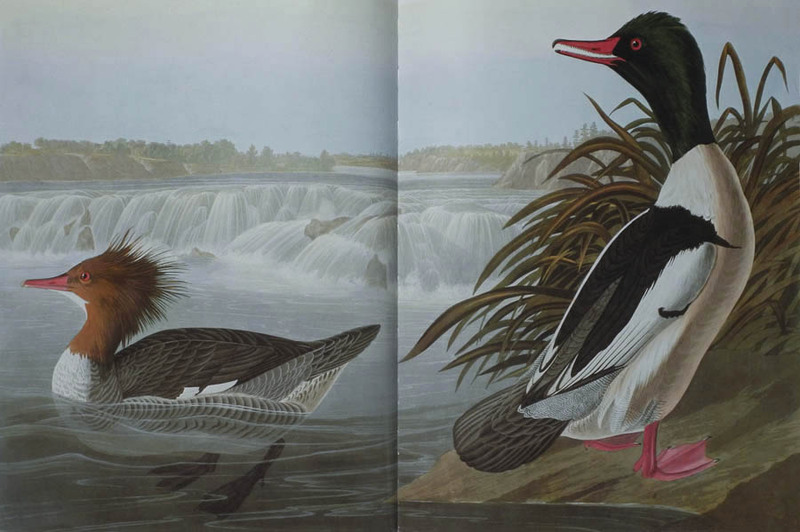 He has provided notes on every one of the birds depicted in the 435 plates. 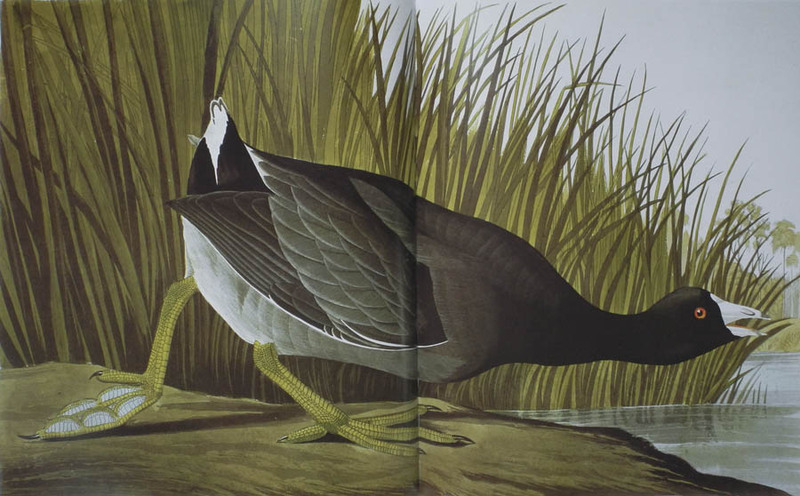 I am delighted by the elegant compositions in Audubon's plates. 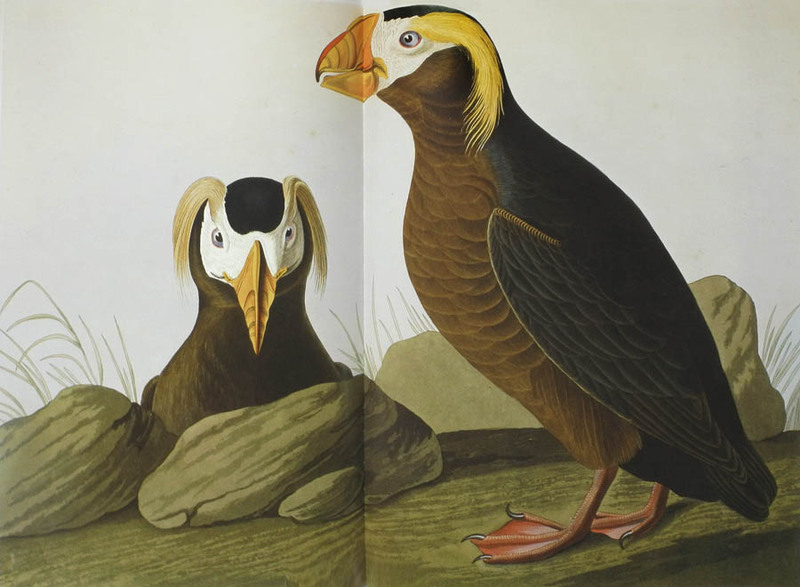 In his original "double elephant folio" of The Birds of America of 1838 each bird was shown full size on very large sheets of paper, 39 1/2 x 28 1/2 inches. The grace and tight compositions of many images were necessary in order to fit a large bird at life size within that sheet. Audubon used wire to hold the (dead) birds in lifelike positions. He studied their habits and habitat so as to portray them more accurately, an advance on the ornithology of the time. goauche, black ink and collage on card. 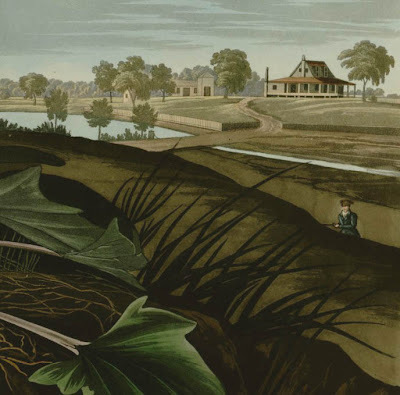 As a painter and sometime printmaker, I am fascinated to see the comparison between one of Audubon's original paintings, now at the NY Historical Society, and what is generally called the "engraved" plate. At the Wikipedia link above I learned that etching was utilized, along with engraving and aquatint. The prints were then hand-colored in watercolor. 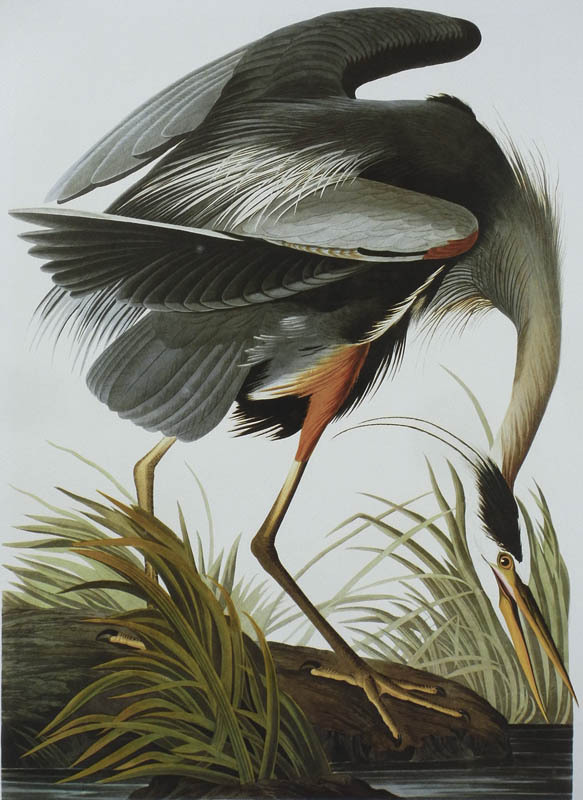 Audubon was very lucky in his printer, the London firm of Havell, which did an outstanding job of transferring drawing to print. In fact, I feel that the prints have a quality of timeless presence, a simplified yet true sense of form, a great sensitivity in their descriptive lines, that adds so much to the success of the work. Looking at this detail, much of the drawing seems to be engraved, with the tones of beak and grasses added in aquatint. 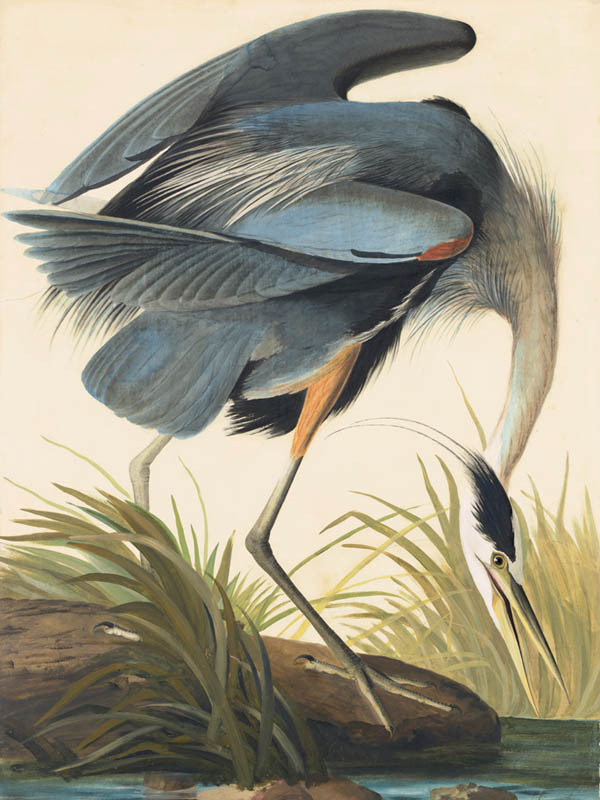 The hand coloring is remarkably fine, though the heron could use a bluer feather color, as in the painting. 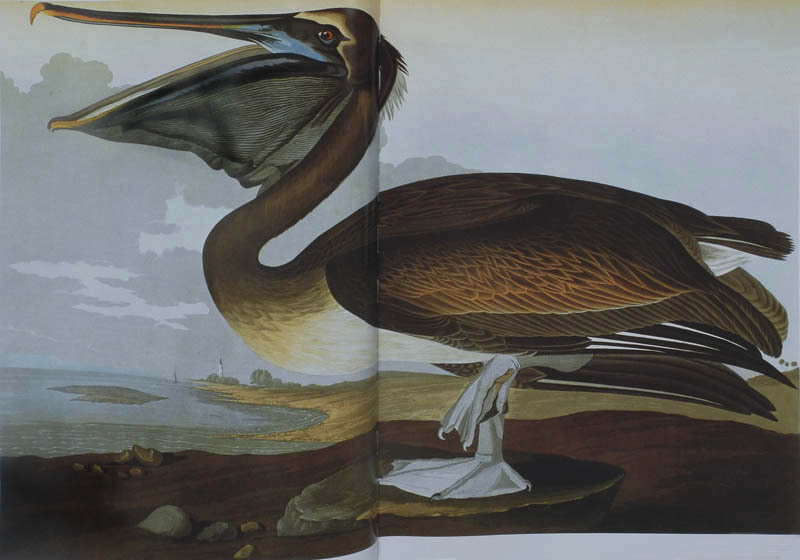 As I was looking through this volume for images to photograph, I realized that I was most drawn to those of the large birds, whose forms fill the page. In this edition, many of these horizontal images, which would have been printed horizontally on a single sheet in the elephant folio, are printed across two pages, which is why you see the curve of one page meeting another in my photos. 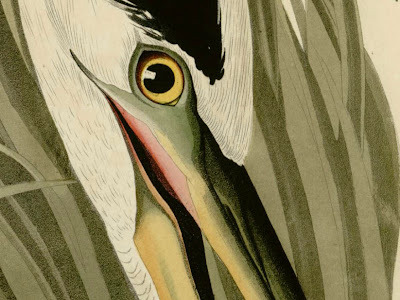 Audubon paid careful attention to the edges of the picture plane, with forms coming close or touching those edges, creating a pictorial tension. Looking at this image, with its plain background, the clarity of outline becomes evident. It is present in all the prints, a quality that makes form more real and at the same time abstracts it; it is more volumetric than, say, that in Indian miniatures, but has a similar effect of a thing that goes beyond naturalism to an essential idea. These puffins also delight me because they're so humorous. 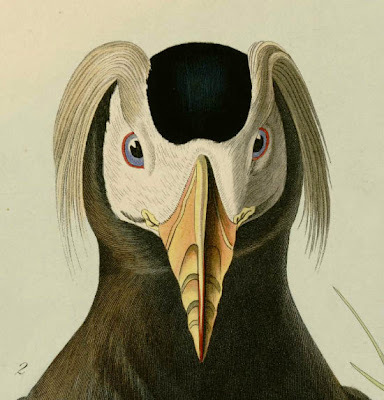 I think this bird is marvelous, and it reminds me of the times birds have looked at me with their quizzical expressions, or the one time I saw an owl high on a tree in the woods, who seemed to stare at me with a similar piercing gaze. At times they congregate in vast numbers, and swim so closely that a hunter in my employ, while on Lake Barataria, killed eighty at a single shot. They are extremely abundant in the New Orleans' markets during the latter part of autumn and in winter, when the negroes and the poorer classes purchase them to make "gombo". The snowy egret....has become the proudest symbol of the National Audubon Society, the great conservation organization that has adopted John James Audubon as its patron saint. ....Where there had been hundreds of thousands of egrets in our southern states there soon remained but a few hundred. The National Audubon Society fought for plumage laws, and to meet the emergency hired wardens. The first Audubon warden in South Florida, Guy Bradley, was shot by plume hunters near Cape Sable in 1905. ...Under protection the egrets and all the other long-legged waders have made a spectacular comeback. Plume hunters never shot cept in the breeding season when egret plumes are coming out real good. When them nestlings get pretty well pinfeathered, and squawking loud cause they are always hungry, them parent birds lose the little sense God give 'em, they are going to come in to tend their young no matter what, and a man using one of them Flobert rifles that don't snap no louder than a twig can stand there under the trees in a big rookery and pick them birds off fast as he can reload. 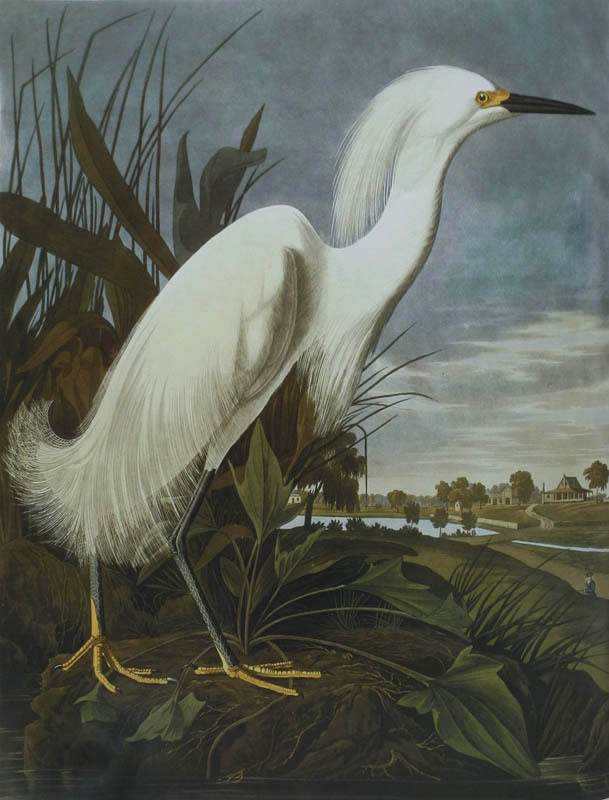 According the Peterson's note, the background of the snowy egret image was a rice plantation in the Carolina low country. 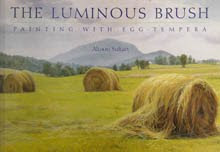 I had not known this, but learned in the introduction to this volume that Audubon had several apprentices who painted many of the backgrounds for his birds. Like so many thoughtful sportsmen since, he eventually developed a conservation conscience. In an era when there were no game laws, no national parks or refuges, when there was no environmental ethic, when vulnerable nature gave way to human pressures and often sheer stupidity, he was a witness who sounded the alarm. 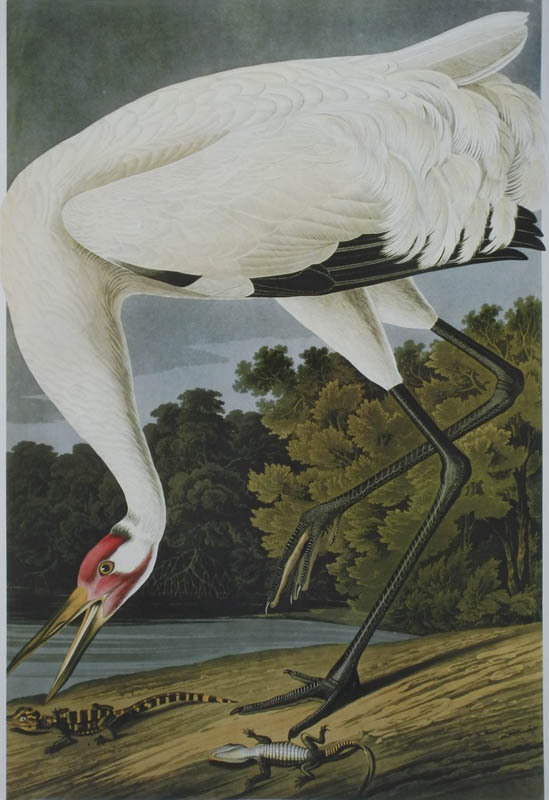 To mention a formal quality in this print that I love: on both the right and left margins, the body of the crane extends past the boundaries of the background, giving it a sense of grandeur and fullness. I enjoy seeing images of birds that I have known personally, such as these mergansers who have shown up once or twice on my pond. The background of wide falls is especially wonderful; the note on the print says it depicts Cohoes Falls in New York state. 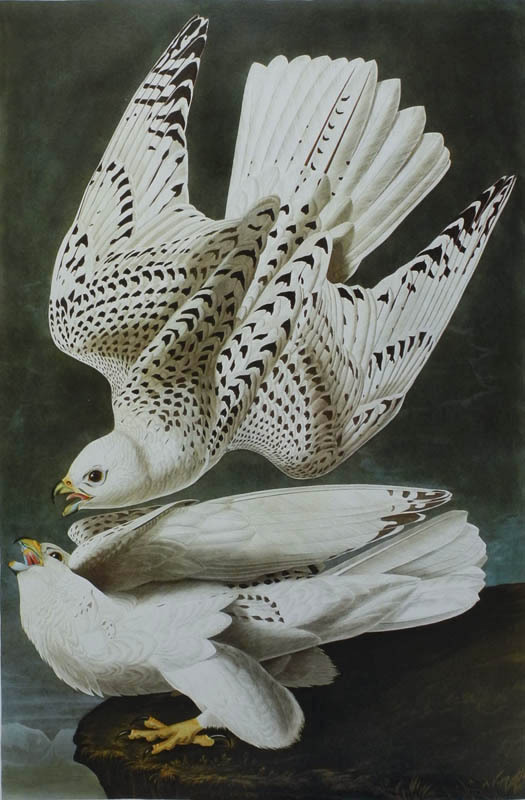 .....similar to the stunning image of the gyrfalcons. 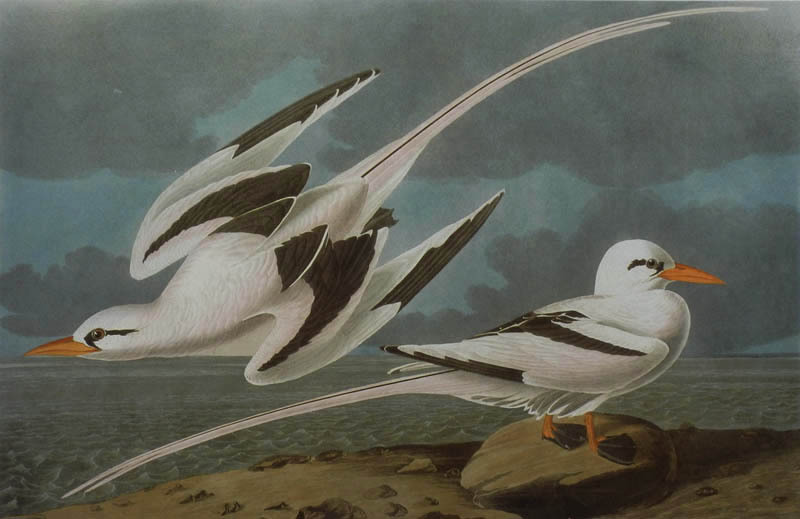 Here the flight is more tense, with the tropicbird more flowing. 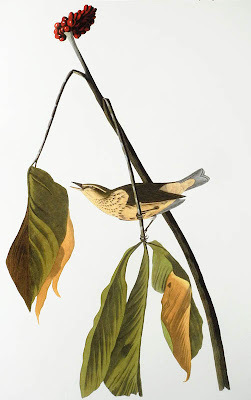 For a final image I thought I'd show one of Audubon's smaller birds, a minimal image of branch, seed, leaf, and bird. Audubon's aim in his great work was to picture and describe all the birds of North America, a similarly ambitious goal to that of Edward Curtis's The North American Indian. Their passion and perseverance have given us works of great aesthetic beauty and deep understanding. *This post is dedicated to my brother-in-law Dr. William Ross, who gave me this grand book. He is a man of wide ranging intelligence, never-ending curiosity, and with a warm heart. Thanks, Bill! A New Painting: "Untitled (Dark Red, Light Blue)"